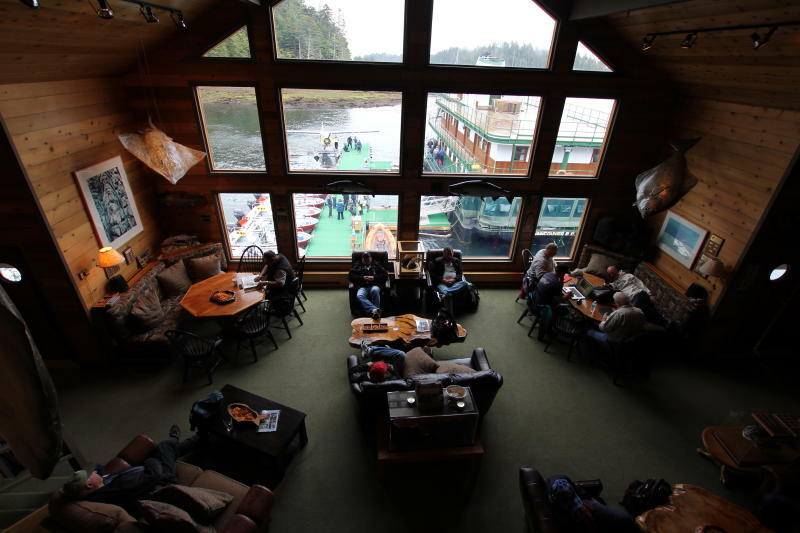 Langara Fishing Lodge has consistently set the bar high for service, food and fishing. Located in the picturesque Haida Gwaii (formally Queen Charlotte Islands), this old whaling area has been transformed over the years into a mecca of fishing with visitors from likes of Bob Hope to your average Joe and often Joanne Angler. The location boasts access to some of the best waters in the west coast of Canada as well as many options to drop a line in calmer waters. 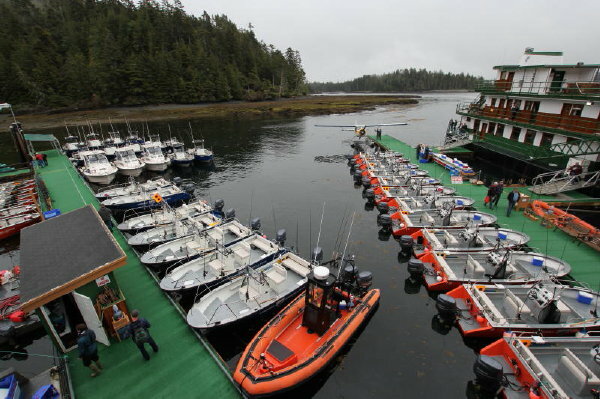 A combination of many positives makes the Langara Island a prime sport fishing adventure destination. 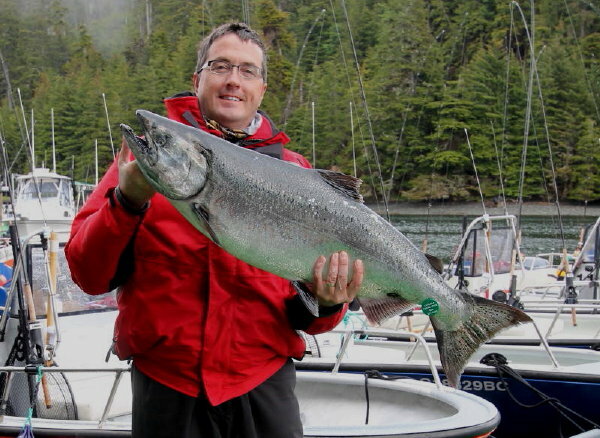 Other well known lodges in the area include West Coast Fishing Club and Langara Island Lodge . Thursday was an incredible memory filled with a lifetime of experiences. We started off the day stopping offshore Boulder to try mooching around a giant floating armada of sea birds. Paul starting cutting bait while I readied the rods. Paul said “ummm. Kevin. Look at this”. Changing focus from the rods to the bait cutting board I saw nothing odd or out of the ordinary. When I looked up at him he was staring off and when I followed his gaze, less than 5 feet away a Humpback Whale was spy hopping, watching us! In the rain we scrambled for cameras and danced around the boat. Words cannot describe the sheer exhilaration of seeing such a magnificent sight. You can check out this video for more! Humpback pays us a visit! I could say it was pretty dam cool and that would be a huge under statement. Experiences like these makes people seem insignificant amongst nature's grandest animals. My wife laughs but I sensed intelligent interaction with the humpback. I felt he was show boating to the people on the boat... not to the boat. Which ever side we were on he seemed to follow. When I took some underwater shots he seemed especially interested and almost acted like a toddler trying to impress. To me I see the intelligence in the fact the whale's actions implies he knows the people appreciate him versus an inanimate object like the boat. After this fabulous whale experience the fishing was spectacular for Chinook salmon. Chinook salmon also referred to as King and/or Spring salmon and migrate past Haida Gwaii on the way to spawning rivers. They are native to the Northern Pacific Ocean including the United States and Canada. They can also be found native from Northern Japan to Russia while introduced to South America and New Zealand. These incredible fish can grow over 125 lbs and put up an incredible fight on tackle and make for some great eating. Chinook salmon fry can stay in fresh water for the first 1-2 years of their life before making their way to the ocean. Once in the ocean they can stay for 1-5 years growing all the time and feeding on krill and fish. Their main predators change as they grow from birds and other fish when small to salmon sharks, Humboldt squid, Orcas and people. The fishing highlight must have been the point in time we had a quad on. I was up next for the bite...then when a Chinook hit I set the hook into a nice one. Paul set the hook immediately thereafter on a second King! I took a second to reel up the third rod to prevent tangling when it’s rod tip drove hard to the water. A third Chinook was on! I frantically tried to reel up the fourth rod while in the holder when that one also started screaming line charging hard away from the boat. Frantically we raced from rod to rod, reeling and untangling crossed over lines. We had lines crossing, giant silver fish jumping, heart pounding pandemonium. Chinooks went from sounding, to jumping and then screaming across the water in what was the most adrenaline fueled exciting fishing moment of my life. 4 Chinook on at the same time and all in the mid to high 20's! In the end we boated 3 of the 4 and released 2. Every time thereafter we dropped the lines we were in a fight. The fishing was frantic that day and the previous days before. We had numerous double headers over the trip, a number of triples and the quad. We limited out on Chinook, Halibut, snapper, rockfish and lingcod. We personally did not see any Coho but many Coho in the 5-7 pound range were caught by others on the trip as well as a couple Chum and 1 Sockeye. 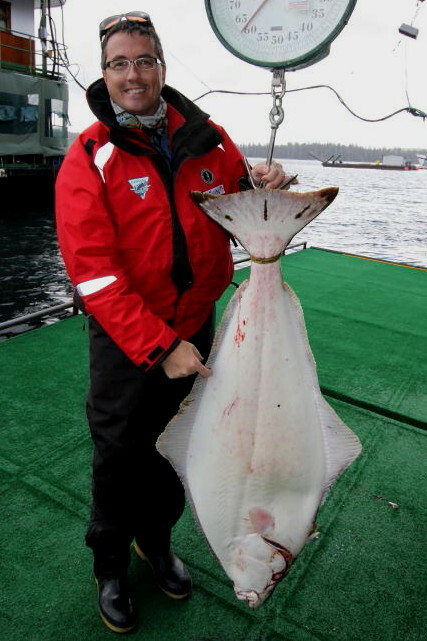 I caught the largest legal halibut at 125 cm and it weighed 59 lbs. Paul and I loved doing it all ourselves...baiting, driving, hook setting and netting. My other snickering friends on the trip did not think we would do so well unguided so there was a little pride on the line. When we finished the trip we could actually say we did better than some guide boats and while I hooked into two 40lb + Chinooks only to have the barbless hooks pop out, my buddy did land a 40 lber. The biggest Chinook caught on our trip weighed in at 42.5lb, 45 lb and 50 lb. 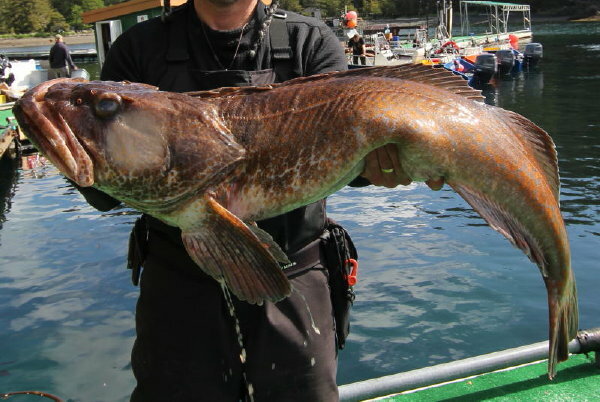 Combined with landing a 59 lb halibut we out fished many boats based upon fish quality. I have to say that the main reason for my success is being able to emulate my mentor Dave Car whom I have great respect for as a guide as well as a person. He is smart, witty, easy going, funny and above all, serious about catching FISH! I have been guided by Dave for a number of years and while at times I often feel dazed on a combination of late night drinking and poker, morning Gravol… the lack of sleep and the medication seems to have granted me some degree of absorption of information and skills from watching Dave’s sport fishing magic. It was through this instruction that he must of taught me a few main fundamentals of catching salmon that came in handy, protecting my pride. 1)	Bait presentation - Properly cut and rigged bait (cut plug herring being the preferred method out here) is critical to your success. Attraction to a naturally looking wounded bait is essential to maximizing success. There is a correct angle to make the cut as well as optimal hook placement in the bait. I must say this is above the most critical if you want to catch more salmon. 2)	Location – Being where the fish are seems simple enough but how many times have you seen fish jumping or being caught by others and left or fished elsewhere. Salmon are schooling fish. Likely where there is one there are others. Pay particular attention to where the fish were the day before and when. Listen to the radio for indications of a bite and understand if a bite is occurring which way the salmon are likely traveling. A big mistake some make is following a bite rather than getting into or ahead of a bite. It can be a frustrating day if the bite stops every time you arrive. 3)	Tide – The ebb and flood of the tides are soothing to the mind and also bring nutrients and life to the waters all around the world. They can be huge off the Queen Charlottes with 15 foot swings causing massive standing waves, whirl pools and fast currents. These naturally help move and guide salmon around as they seek out food and follow bait that congregate around ocean eddies and back waters not unlike freshwater rivers. Sometimes the sheer size of these back eddies go unnoticed to fishermen than miss the enormous subtleties of the massive ocean environment. 4)	Timing – When fish move can vary with light and currents. Some places better in the morning, others in the afternoon. Learn these recent reports from the locals. Some areas attract salmon that stay a while to feed and other places are just travel corridors. Timing can be directly related to location, tide and depth. 5)	Depth – Salmon can be in 15 feet of water or 400 feet of water. Typically we fish in 40 – 200 feet in the Queen Charlottes and 40-100 feet being most common. You need to fish to the depth the salmon are most likely to see the bait at as well as taking into account bottom depth and contour for bumps that can snag bait or hold black bombers that steal bait. Don't be afraid to be above the salmon as often then can race up from depth to hammer a bait. The flashing twirl of an injured herring is often too much of a temptation to pass up. 6)	Speed – The combination of how the cut plug herring is cut and hooked as well as boat speed determines the twirl of the bait in the water. You want a fairly open curl for Chinook fishing and tighter for Coho. Slower presentations work best for Chinook and faster for Coho. Check the bait in the water for the right movement and change up if not seeing bites. When salmon are plentiful, self-guiding can save money and significantly increase the mental reward of doing it yourself. When the fishing is challenging, there is no one better at catching fish than the local expert guides. They can do all the points above better than most self-guided fishermen due to practice, repetition and experience. A good guide knows the tricks to catching fish. The best guides do that and also think outside the box and keep trying something different when all else fails. The lodge staff also made self-guiding easier. The dock staff had all our gear checked and replaced, boat gassed up and fish caught weighed and measured. They cleaned all the gear and kept us well stocked and even provided some advice when needed. They also showed little emotion if we accidentally came into the docks too fast. Ops. In considering our experience this year while mooching (semi passive drifting cut plug herring) we typically fished at 15-24 pulls. We actually went a little too fast at times and still caught fish which shows how the novice can get a break from time to time. My experience over the years with Dave gave me an idea of where to fish and what depth while still trying two new spots I never went to before. Best advice is be adventurous in your fishing and don’t be shy to move if no one is catching while being aware of tides and when fish are expected to push through. I am not sure but I am leaning to going unguided again. I am so stoked for the next trip! Everyone should get out to the west coast this year for some exciting salmon fishing!